It's always a pleasure to make new dishes from food left over from other meals. Christmas is the greatest opportunity to be creative with leftovers and I am drawn to the tart, flan or quiche as a vehicle to use up those bits and pieces of delicious food. 1 quantity of shortcrust pastry, baked blind in a flan tin. 1. Gently saute the onion in a little butter, add the bacon pieces and cook until golden, leave to cool. 2. Spread the onion and bacon in the base of the flan, chop the turkey into generously sized pieces and scatter over the onion and bacon. 3. Break off pieces of Brie and distribute evenly across the flan base. 4. Whisk the eggs, add the cream, lemon zest, seasoning and grated Parmesan, pour into the flan case. 5. Bake for 25-30 minutes until the filling is golden brown and just set in the centre. Remove from the oven and allow to cool for about 10 minutes before serving. 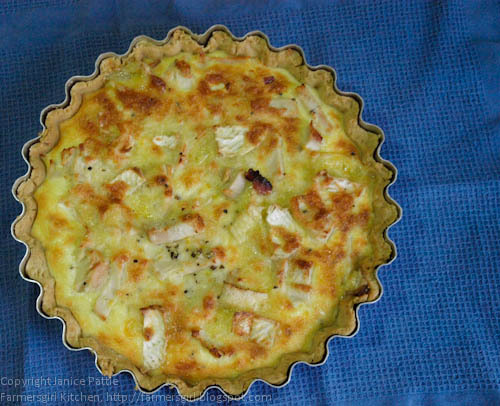 This is a very rich tart and only needs a green vegetable or salad to make a meal. What did you do with your leftovers? I love pies and tarts and this one looks gorgeous! I would have to have a little leftover cranberry sauce on the side. Brie and cranberry are such a delicious combination. What a great way to combine some of the very best of Christmas. Debs: we did indeed have cranberry sauce with this tart and it was a great combo. Dom: yes, I know, it's the cheese, cream, buttery pastry thing, it couldn't taste anything but good! I admire that you had the energy to rustle up a tart:) What a great way to use up those tasty leftovers. I love my leftovers too and often make pies and tarts with them! Yours looks and sounds lush! I made a camembert and cranberry flan with mine...you can't go wrong with leftovers, often better than the main event IMHO.